The Quote Date is automatically set when a Quote is first sent. You can also change (and manually set) the Quote Date if you need to provide a ‘backdated’ Quote. Open the Quote that requires the change. If the Quote has already been sent, hit ‘Actions’ (top right), select ‘Edit Quote’, then follow the steps to take it offline and edit it. 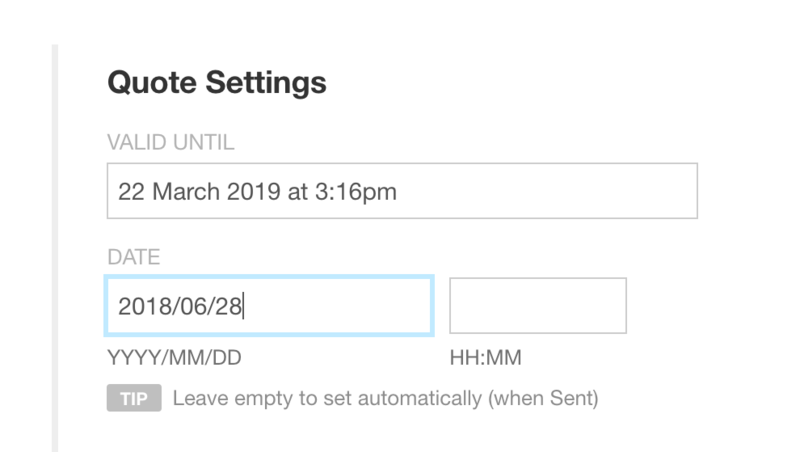 Click into the Date field, and enter the desired Quote Date, in a YYYY/MM/DD format. Scroll down to the bottom of the Quote screen, and hit ‘Save’. The Quote will now be fixed to the new Quote Date.